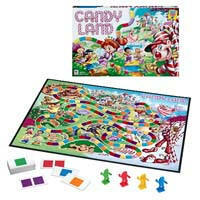 Every child's first game, CANDY LAND is a colorful way for a preschooler to experience the joy of game play. The game teaches color recognition and matching while reinforcing the lesson of taking turns and being a gracious winner or loser. This is a Milton Bradley/Hasbro game. Age range: Pre-school.